I promise, the gym isn’t as scary as you think it is. Now, I used to be terrified of gyms. They smelled bad, were full of Gym Monkeys and ‘Roid Junkies grunting and lifting big heavy weights and growing fangs with beedy red daemon eyes that would stare into your soul as you walked by, hissing in glee as they prepared to eat your soul. Or, you know, something like that. The first feat is the changing room. If you bring Lysol wipes to wash out the bottom of the locker, people will look at you strange. I wouldn’t recommend doing that. But as long as you avert your eyes, you will –mostly– avoid seeing anything life scaring. And the exhibitionist leather-skinned 50 (or 60?) year olds that walk around naked throwing their junk all over the place are really just senile. Or so I tell myself. Just don’t talk to them. Or look at them. Maybe throw some soy nuts in their direction as a distraction. Okay, so you have now managed to wiggle yourself into some sort of moisture wicking get-up (and if you haven’t, stop right there, go to Winners or Wal-Mart and find some. It will change your life. You don’t need to spend $650 on a pair of pants from Lululemon. The 10$ ones you found on clearance will do just as well, take a beating, and will hold up in the drier a lot better. ), and laced up the new pumps. Time to venture into the belly of the beast. Take a deep breath. Brace yourself. Step out into the gym. The first thing I always do is familiarize myself with the lay of the land by filling my water bottle. Casually make your way over to the fountain while surveying the assembly. You are not Cersie doing a naked walk of shame through King’s Landing. I bet most people don’t even notice you there, and hun, you’re the only person that can hear the Chariot’s of Fire theme song playing triumphantly in the background. The Gym Monkey: That wonderfully fit person in tight spandex with rippling muscles and the quiet confidence and comfort only possibly achieved by living in the locker rooms. Give it a few weeks and you will notice that these people are always here. Always. In general, they are actually quite friendly. They are all besties with the personal trainers and instructors at the gym. They have inside jokes with the other gym monkeys. But unless they have seen you at the gym enough, they won’t deign to acknowledge your presence. If, after several months of sweat torture you manage to win a nod from one of them, you’re in. You’ve made it. The ‘Roid Junkies: These differ from the gym monkeys because their arms are the size of your thighs. They will mostly be found in the weight area, grunting loudly, sweating profusely, and are all round intimidating. And possibly on steroids because how else can you get arms that big!?! These are actually really nice people. And probably not on steroids at all. Aside from asking you if you’re still using such-and-such a machine, they are quite friendly. When first approaching the weight area they will look at you skeptically, and clear a path, but in general I find they are quite understanding. Bring a friend if possible and laugh at yourself openly when trying to figure out exactly how to contort yourself into the machine and they will actually become fast friends. If you find the right one, and ask them politely to help you out with a certain weight, they are almost always happy to oblige. Or will look at you skeptically and walk away. Either of these results are just fine by me. The Fashionista: This is the skinny twig that wears see-through scampy tops, skin tight booty shorts, and will flounce around the gym flitting from one machine to the next, stopping just before she starts to sweat. She will spend half her time in the changing room fixing her hair and applying make-up, and the other half of the time trying to get the attention of the ‘Roid Junkies. Thankfully, since you are NOT a ‘Roid Junkie, she will generally ignore you. Unless you get a little too close and your sweat filled aura affects her perfectly applied lip-gloss and she will glare you down. But that’s okay. Laugh at her in your head and get back to work. how unfair it is that Mr. Brown like, totally wouldn’t let me hand in my essay late? Like, I so tots was way too busy to write it because like Josh was like snap chatting with me and like OMG I was looking soo hot. Yeah. Real world issues. For realz. The Elderly: I have such a soft spot for little old men. They are just adorable. And friendly. They will give you a knowing smile and shuffle over to the next machine. The Overweight: Wait. What? Is that a somewhat overweight person over there on the elliptical huffing and puffing? And there, on the treadmill, that man is twice my size. And there, a woman with the mother’s ponch with her best friend talking about daycare and losing baby weight. They are, in fact, normal people just like you and me. It will be alright. Maybe, just maybe, this place is not so scary after all. Being awkward and clumsy as I am, I try to avoid any over complicated weight machines, or ellipticals, or things that generally require some sort of hand-eye co-ordination. So I tend to gravitate towards the treadmills. In general, these are fairly straight forward. Approach with caution. Address it calmly, like a startled deer. Step on. Pick a speed. Rock it for half an hour or so. Get off. Except you can’t quite figure out the buttons. Or you miss a step and your shoe squeals. Or you start getting into it and go a little too fast and smack into the front hand bars. Or you get distracted by the TV just off to the left and veer side to side. Or go flying off the back of it. Or start choking uncontrollably on your water because you swallowed wrong. It’s okay. Trust me. No one has ever pointed or laughed at me. Most people, I find, will avert their eyes if you have a misstep or do something uncouth. In general, people don’t notice. Or at least have the courtesy to pretend not to. Because they have all been there. You have now survived. Your face is beat red, you’re sweating profusely, but you. Are. Victorious. Wipe down your machine, and find a corner to stretch. I find most gyms don’t provide you with set areas, so I tend to gravitate to the strange TRX rig. The thing that looks like a swing set missing the swings. Although stretching is not always popular, I strongly recommend taking some time (and maybe a few dirty looks) to stretch out. You will thank me tomorrow when you can barely move. Just avoid any direct eye contact with yourself in the mirror. It’s better that way. You don’t need to see how ridiculous(ly amazing) you look. Brace yourself for the single most horrific moment of the gym experience. The showers. Now, before you think to yourself you can just shower at home (like I had a habit of doing) please, please, take into consideration the other people taking public transit and/or your car. It is not worth it. And bum shaped sweat stains tend to linger. You are welcome to use the stalled in changing rooms, or even strip down in the shower itself if you would prefer, but I find in general, people are there to get in and get out with seeing as little as possible just like you. Grab the soap and bring some flip flops and you will get through this. The first time is always the worst. So tell me, was it really all that bad? The most difficult challenge to weight loss is also the first you will come across, actually doing something about it. You’ve taken the first steps to acknowledge that something needs to change. You’ve let that sit in the back of your mind as your muffin top slowly engulfed your waist line. You’ve finally heard and accepted as true the word “overweight”. You’ve convinced yourself that now is the time to finally do this! You’ve (tentatively) decided to take action! And now, you have no idea what to do next. Which brings me to step 1. The single most important thing you can do at this point is to schedule in work-outs. Now, I have set myself the rather enthusiastic goal of devoting 5 hours a week to fitness. According to the Canadian food guide recommendations, adults should be active a minimum of 2 and a half hours a week. So I figure if I want to counteract the 40+ hours a week I spend sitting in a cube and if I want to actually lose weight, I would need to overshoot that target. I just don’t have any time. This is probably the most used excuse. And I will have none of that! If you manage to schedule in time to binge-watch Orange is the New Black on Netflix, you can schedule in time to be active. Now, I am not asking for you to devote 2 hours a day, 7 days a week to “lose 30 pounds in 3 weeks while doing this ridiculously over energetic spandex-clad work-out video”. I am asking you to a) be realistic and b) don’t be so realistic as to not schedule in any time at all. I’ve broken my days down into two main time frames, AM (before work) and PM (after work). To start things off, I’ve picked activities that I am most comfortable with, eg. activities that I have tried to do in the past with some measure of success. I’ve also kept my weekends free, because the last thing in the world I want to do is hit the gym instead of my sacred Sunday morning Starbucks. If you’re any good at math, you’ll notice that I’ve only scheduled in 4 hours a week. I’m all about baby steps, and want to give myself room to grow. And also room to fail. I don’t expect to be able to jump into this schedule full swing right away. I figure it will probably take a month or so before I actually manage to roll out of bed early enough every work day to roll out the yoga mat, but I’m all about setting goals that I can work towards. Take a look at what your weekly obligations are at the moment, and work around them to try and integrate something as seamlessly as possible. If you are desperately struggling to find time in your days, I would also suggest that you reconsider sleep obligations. Most of us have been lead to believe that you should ideally hit 8 hours of sleep a night, but recent studies show that the ideal amount of sleep for adults is 7 hours. With that in mind, you might be able to find an extra hour a day to devote to sweating instead of sleeping. And if you find that your 5 hours of sleep a night pattern has suddenly been banished, you might want to reconsider how much time you spend a night in front of a screen. Sorry. Finding a set schedule creates an obligation that would otherwise be lacking. Putting off workouts to tomorrow is no longer an acceptable excuse. Treat your scheduled in time like any other appointment you make, and try your best to stick to it. If possible, you can even set times to stick to in an attempt to keep things on track. 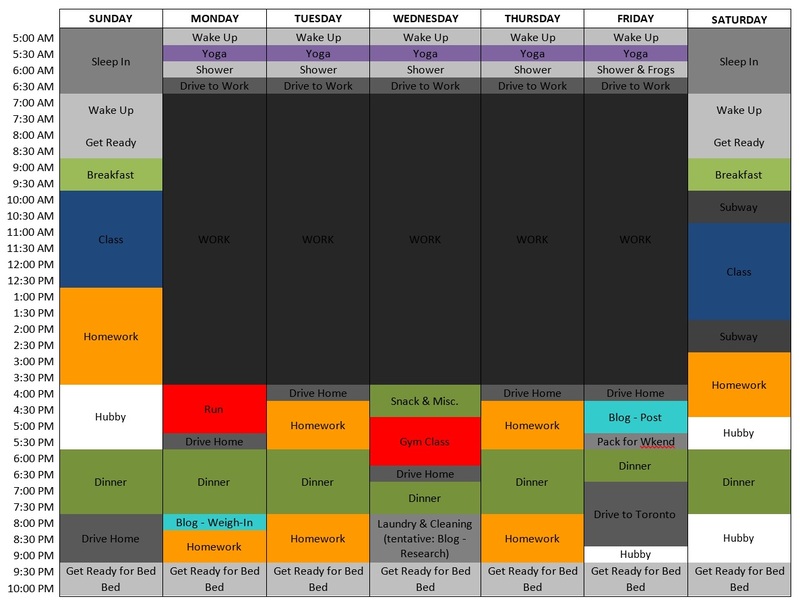 And if you’re as OCD as I can be, you can even schedule out everything else in your life, including dinners, blogging, and time with the hubby. No really.